The T14 facade is at an advanced stage of installation, and during the past week water tests were being prepared on site. 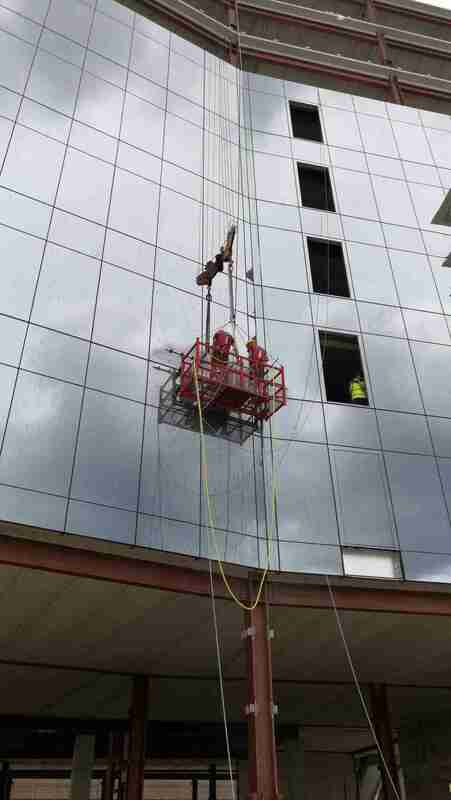 A testing rig was designed and mounted by JSDimech following the requirements of BS EN 13051:2001 – Curtain walling- Water tightness – Site Test as well as CWCT Technical Note No. 41 – Site testing for water tightness. A number of trials were initially carried out to ensure that the testing apparatus is achieving the required flow and pressure at a continuous and uniform rate for 30 minutes – the duration of each leak test. Once this was complete and some nominal problems addressed, the FSJV proceeded with the official tests together with the participation of the Client’s Perit. The tests include the setting up of test equipment to have 12 water jets opening up to 65 degrees installed on a header of 3.5m to simulate rainy conditions. The nozzle tips are placed at a distance of 250mm from the facade and a flow of 5L/min is maintained for the duration of the tests. From the other end, technical personnel inspect the area being tested for any evidence of leakages.